When I arrived here in Bacolod last October, I have enjoyed my afternoon alone at home with our landlady’s dog named Tricia. She is just a local breed but looks pretty cute with her black stick fur. Every time my hubby and I buy food outside, I always bring home the leftovers or buy I would buy a meal just for her. Unfortunately, early evening last night, while the whole neighborhood was in pitch black because of an electricity failure, our landlady found Tricia dead lying on the ground. We really don’t know what caused her death since her chains were not that tight. We could not determine if she was hit by something hard because her fur is as black as the night. 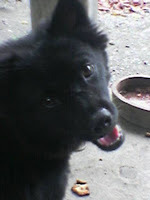 Anyway, I will surely miss that dog Tricia. She was a very good guard dog. I always felt safe even if I was left alone in the house. And on the other side, I felt sacred. Was she killed on purpose or was it an accident?? Even though she is a dog, mysterious deaths are pretty much scary for me!